'Mododa'e diburi'e bioje'oho. - Tail-feathers of the swift when sitting in the tree'. Ilma Savari has created the first part of the design of the modadai (swift) bird. The cross design represents the two beautiful long tail-feathers of the modadai as they fall and cross over each other when it sits in the tree. 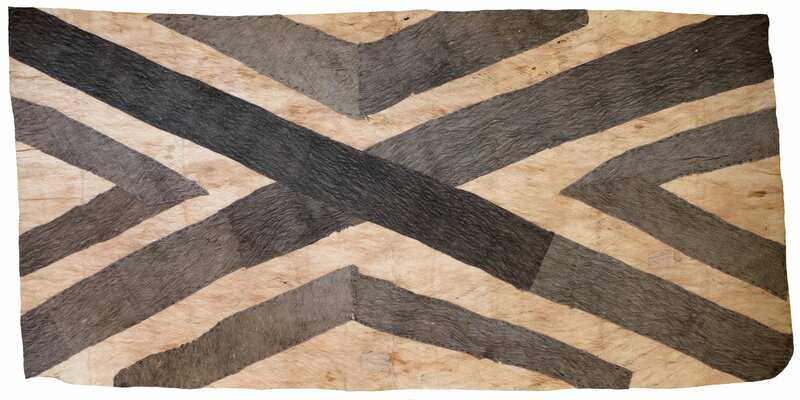 This is an ancestral sihoti'e design (design of the mud) whose origins can be traced back to the Koruwo village area on the Managalasi plateau c.1880. The design was sewn with a bat-wing bone needle and a river reed was sgredded to create the sewing thread. The Omie creation story tells of how the very first sihoti'e nioge was created by Suja, the first Omie woman and mother of the world, under instructionfrom Mina, the first Omie man, after she experienced her first menstruation. Suja dyed the plain barkcloth in the volcanic clay at the River Uhojo at the base of the sacred Mount Obo. Suja wore the mud-dyed barkcloth during her menstruation and lived in seclusion in a small hun known as je'o jarwe (also called ivi"ino'ove'tove) for its duration. Omie legend tells of how in the very beginning when the first ancestors emerged from Awai'i underground cave onto the surface of the earth, Omie and Managalasi people were one tribe but later split into two tribes. This is why both Omie and Managalasi people share many of the same ancient barkcloth designs, including sihoti'e. It was extremely fortunate that Ilma's Managalasi mother Sarah Ugibari, from whom she inherited this design , married an Omie man and moved to his village otherwise her important art may have been lost. In both of the Managalasi villages, Koruwo and Kiara, where she grew up, the missionaries collected all traditional cultural itmes, including barkcloths, created piles and burnt everything. They also imposed a ban on traditionl initiation, marriage and funeral ceremonies and the production of barkcloth. Sarah's art has taught us that the historical cultural links between Omie and Managalasi people is incredibly strong and that the practice of sihoti'e, as evidenced in the Omie creation stories, is ancient.